2. Point of care ultrasound is very accurate for distal phalanx fracture. 3. Depending on your current practice pattern, finding these injuries on ultrasound may not change management. Nail bed injuries are common. The nail itself often times precludes comprehensive exam of the injured structures. Some have proposed lifting the nail to diagnose any underlying injury, but this can be uncomfortable to the patient and cause problems with healing. The idea here is to see if point of care ultrasound (POCUS) can be used to visualize injuries to the nail bed and to the underlying bone. 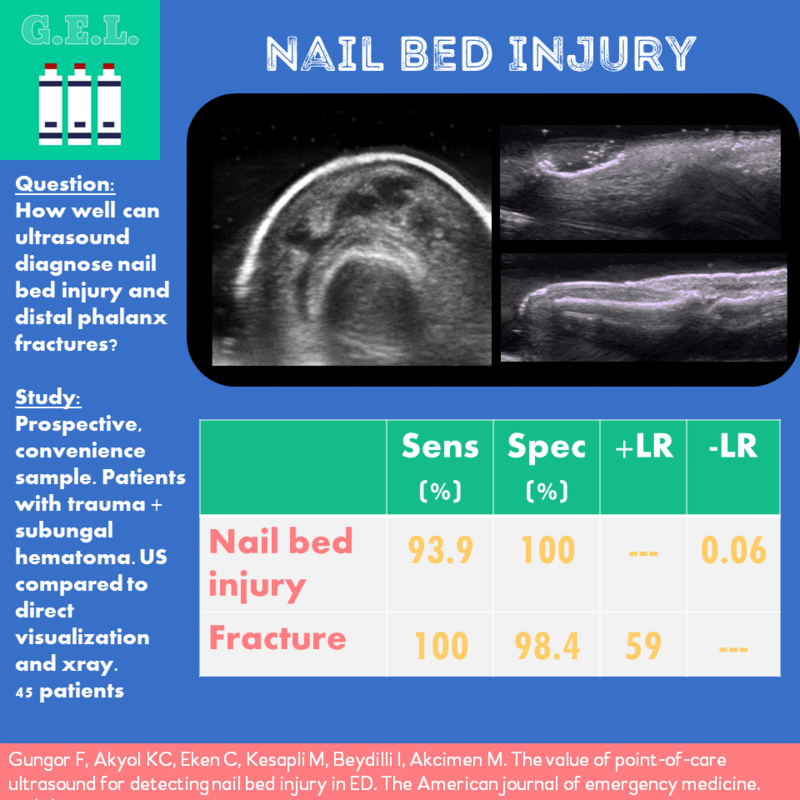 What is the diagnostic accuracy of POCUS for nail bed injury compared to direct visualization? What is the diagnostic accuracy of POCUS for distal phalanx fractures compared to xray? *US diagnosed 1 fracture that was not seen on xray, otherwise would be 100% specific - it may have just picked up a fracture that xray missed. So lower sensitivity for nail bed injury but very specific. Good for inclusion or exclusion of fracture. Confidence intervals are wider than you would like because of small population size. Authors conclusions: you can use US instead of lifting up everyone’s nails and getting xrays for distal fingertip trauma. Appears POCUS performers were not blinded to xray - could have biased the results (potentially inflating test characteristics for fracture). Excluded other nail bed injuries not meeting initial criteria (another 30 patients in this case). Wish they would have included times that it changed management - more patient centered outcome. Unclear if all the injuries diagnosed required repair or intervention.